Near the earthquake epicenter, workers were rescued from a dam that is currently under construction by a Chinese company. 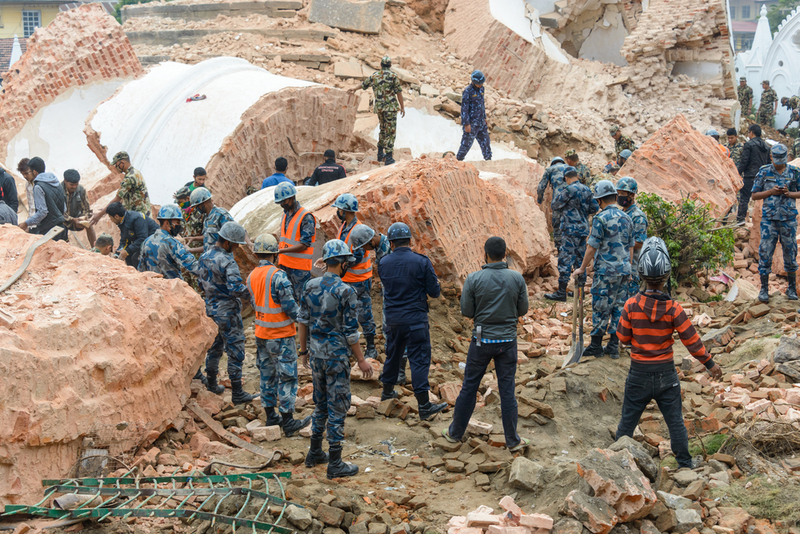 Nepal Armed Police Force, army, police, and civilians start rescue efforts at the collapsed Dharhara Tower in Kathmandu after the major earthquake on April 25, 2015. Reports from outside the capital indicate that hydropower facilities were also damaged. Click image to enlarge. China is mounting an arduous mission today to rescue 250 workers who are trapped at a hydropower station, currently under construction near the epicenter of the earthquake that struck Nepal on April 25, according to Xinhua, the China Central Government news agency. The China Three Gorges Company said on its website that the huge earthquake — which registered 7.9 on the Richter scale — caused serious damage to the 111-megawatt Rasuwagadhi hydropower station. With construction beginning two years ago, the dam is located 67 kilometers (41 miles) west of the quake’s epicenter. The company reported that two workers were killed in the quake and several were seriously injured. On April 28, a child and 24 other people were airlifted by helicopter to nearby Jilung County in China’s Tibet Autonomous Region, according to the quake-relief headquarters in Jilung. Meanwhile, the condition of two additional existing hydropower stations is not known, reported Hydroworld, an industry trade magazine, citing that the 144-megawatt Kaligandaki hydroelectric power station and the 22.1-megawatt Chilime hydropower plant “may have been affected, according to news reports from the area.” The two facilities have not been visited by inspectors. The Nepal earthquake is the latest Himalayan disaster to damage the region’s hydropower infrastructure. A 2013 flood in Uttarakhand, India, killed thousands of people, buried villages in rubble, and severely damaged big hydropower dams in the Himalayan state. Last year, Nepal’s deadliest landslide in a decade caused destruction that knocked out 10 percent of the country’s hydropower-generating capacity. Despite these events, leaders of China, India, and Nepal see in Nepal’s surging rivers and steep slopes ample opportunity to generate electricity from big hydropower projects. In August, Narendra Modi became the first Indian prime minister to visit Nepal since 1997. While in Kathmandu, he negotiated an agreement to finance the construction of two transmission lines and to set up a project office for the 5,600-megawatt Pancheshwar hydropower station on the Mahakali River. The immense electricity-generating installation — close to two decades in planning and development — is more than twice the size of India’s largest operating hydropower project, the Tehri station in Uttarakhand. “Nepal can free India of its darkness with its electricity,” Modi said. Concerns about earthquakes, floods, and huge landslides prompted a powerful opposition movement in Arunachal Pradesh — a Himalayan state in neighboring India — that halted construction of the 2,000-megawatt Lower Subansiri dam in 2010. Last year, Nepal also signed a foreign investment deal with GMR, an Indian construction company, to develop a 900-megawatt dam on the upper Karnali River. The project is expected to be completed by 2021. Hydrologists and electrical engineers estimate that Nepal’s hydropower-generating capacity could total 84,000 megawatts at full build-out. As it is, the country generates less than 600 megawatts from its hydropower installations, which provide 93 percent of Nepal’s electricity. For a nation of 29 million, that is a puny supply of power, and Nepal’s homes and businesses are frequently in the dark.